The more I read about task cards (and the more pins I save on my Task Cards Pinterest board), The more uses I find for them! 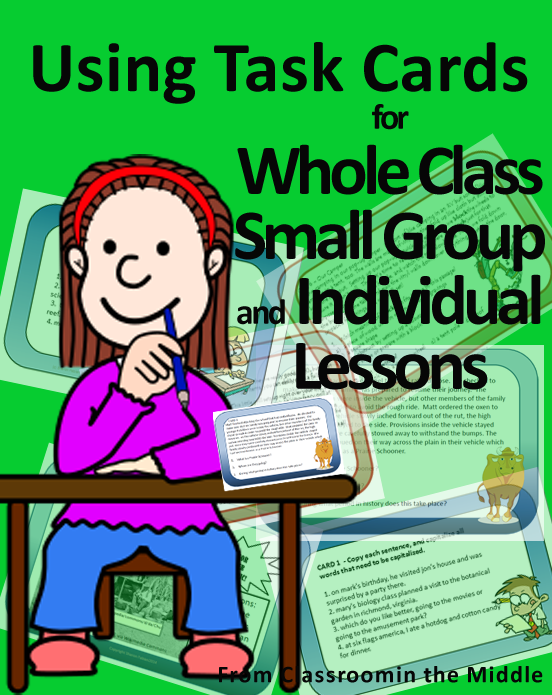 Task cards can be used for whole class activities, small groups, and individual quiet work in a variety of ways. Here are some of them. • Scoot, An Activity with Movement – To begin, place a task card at each student desk, and have students create a recording sheet (or use a handout). Each student begins by answering the questions on the card at their own desk. When the teacher says the word Scoot, (For older kids, I think we just need a different word here. Any suggestions?) students move to the next desk. Repeat until all cards are completed. Prompting the kids to move with the word Scoot (or whatever), keeps the kids on task. •Footloose, Make a Game of It – To play footloose, set up just as you would for Scoot. The difference is that in Footloose, each kid moves at their own pace, and the kid who finishes the most cards correctly in the allotted time wins. •Project It – Get double duty by placing individual cards under a document camera (or use straight from your computer) one at a time and projecting them. An advantage here is that you can be selective and just use the cards that you want to focus on. Use as a targeted assessment, or make it a competition. 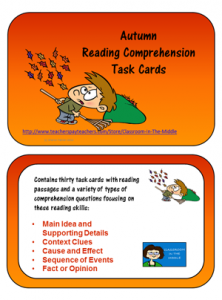 •Centers– A popular use for task cards is to use them in centers. Split up the set, and use a handful of related cards at each center. •Board Games – Pull out some board games or file folder games that require students to answer questions, and use the task cards to make each one a new game! Mix a few sets of cards as needed. 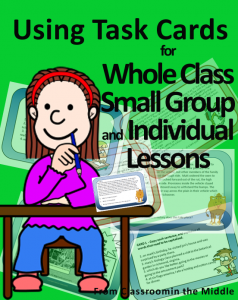 •Cooperative Learning – Another task card standby, assign task cards to small groups of kids. Have the kids work together to complete the activities on the cards. If each group is working on a slightly different topic, they can take a turn being the “expert group” at the end and present to the class, explaining what they worked on and what the correct answers are. •Partner Check – A variation on group work is to have kids work with a partner,or a small group,but in this case, each kid solves the questions individually and then checks with partners to see whether they agree or whether someone needs to reconsider his answer. For Fast Finishers – Keep a set of slightly more difficult task cards on hand to challenge those kids who always finish early. For Targeted Review – Use selected task cards from a set that you have already used for a whole class activity for targeted review work for individual kids as needed. 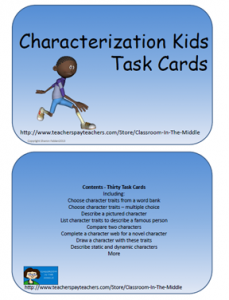 For Homework – Task cards don’t always need to be laminated and saved! Copy a few for at home practice. 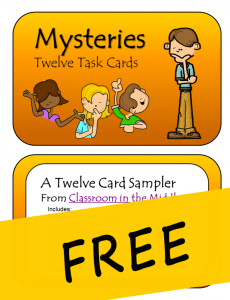 For Extra Credit – Stash miscellaneous task cards in an “Extra Credit” bin. Any kid who is working on extra credit could keep a recording sheet for answers to a number of cards. 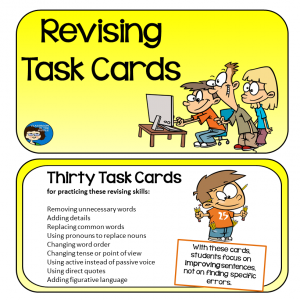 How do you use task cards? Leave a comment, or suggest a link. I’ll keep my list growing. Linked with these great websites! 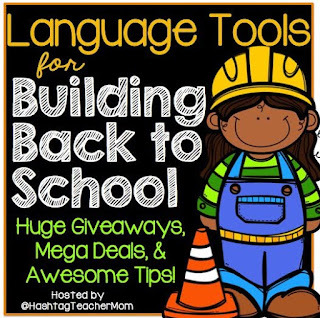 You have some great tools to share! Thanks so much. I like that the footloose let’s the students go at their own pace. Lots of great ideas for using task cards — really helpful to have them all in one place like this. Thanks! 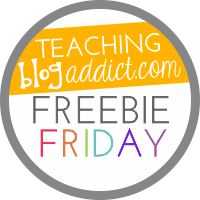 I’m glad I discovered you on Teaching Blog Addict. You have some good ideas. Fantásticas ideas. Las usaré con mis alumnos. ¡Gracias!